Spring weather has sprung — most of the time anyway — and for those who want to garden but lack the space, two organizations are providing an option. The Crook County Parks and Recreation District is once again offering its community garden, as is Prineville Presbyterian Church. Both entities have plots available with multiple resources to help green thumbs get a jump on the season. The parks district keeps its community garden just to the north of the softball field at Gary Ward Park in northwest Prineville. It features 24 plots, four of which are raised beds with cold frames that gardeners can line with plastic to protect plants from the early spring elements. Most of the remaining plots are 10x20 feet, with a few that measure 10x12 feet. The garden, enclosed with an 8-foot-tall fence to keep out deer, includes a shed stocked with gardening tools, hoses and watering timers. Each plot has its own spigot. "We have composted leaves out here," said CCPRD Executive Director Duane Garner. "A few weeks ago, we got it all tilled. ... All of the water comes straight out of (Ochoco) Creek. It is actually really healthy for plants. The soil is naturally really rich out here because it is so close to the creek. I have seen some really nice gardens grown." People can rent plots now for the season. The raised bed plots rent for $30 as do the 10x12 plots, and 10x20 plots go for $40. While that is the case, Garner said that nonprofits that are growing vegetables for a community-minded mission can use a plot free of charge. "There are still plenty of spaces available," he said. "We typically don't run out of room." The same can be said for the community garden at Prineville Presbyterian Church. Managed by Anne Chouinard, the garden features 30 plots of roughly 300 to 400 square feet. The plots can be reserved for the season for $30. "It is an organic garden, and it has really good soil," said Carol Benkosky, who attends the church and is helping spearhead the health-promoting Crook County On The Move initiative. The garden offers tools, including two rototillers, some shovels and rakes and a couple of pitchforks and wheel barrows. The deer-fenced garden offers water spigots, but people will need to bring their own hoses and watering timers. "They have quite a bit of seed that is available," Benkosky went on to note. "There are two Master Gardeners who are members of the church who are willing to mentor new people." 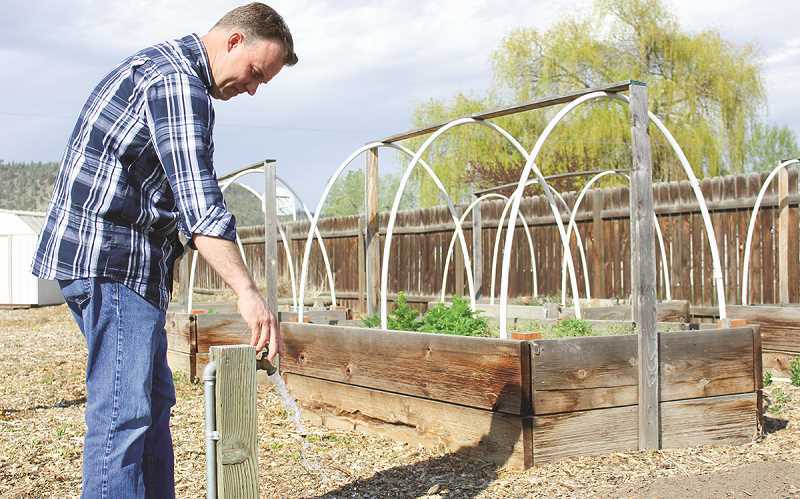 In addition to providing garden plots to members of the public, the Presbyterian Church location will feature some special events throughout the growing season connected to the Crook County On The Move effort. Benkosky explained that during a recent event where people brainstormed ways to improve local access to healthy food, people suggested bolstering the use of community gardens. "One way they want to do that is have a series of events that would happen along the year at the community garden," Benkosky explained. "The first one will be on Mother's Day. It is basically going to be an opportunity for people to come out to the garden and see what it's like." The event will feature eight stations as well as a raffle for prizes such as a basket of garden tools. People will also be given a tour of started garden plots and have a chance to talk to the people growing vegetables in them. "There will be Master Gardeners there to give advice to people and just talk about general gardening and composting," Benkosky said. "The really exciting thing for the kids is they will have the opportunity to get a planter box, fill it up with dirt and plant what we are calling a 'salad bowl' (featuring lettuce and other vegetables)."